Softros LAN Messenger is a secure serverless instant messaging program for user-to-user or user-to-group message and file exchange through your corporate network (LAN, WAN, VPN). 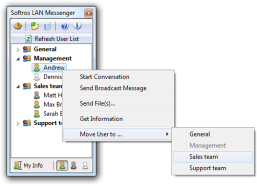 Softros LAN Messenger comes both as conversation-like multiple user chat rooms and as classic single-message exchange with the offline messaging capability. Every message passing through your network will be secured by the AES encryption algorithm. Group broadcast messages allow you to notify all users or certain user groups about an event. The program can log your messages to the local computer or to a centralized file server for you to never lose them. Softros LAN Messenger does not require an Internet connection; it works inside your LAN or WAN preventing employees from wasting their time on chatting with their Internet "buddies" via Internet-based IMs, saving your Internet bandwidth and allowing you to minimize firewall breaches that could allow outside attacks and IM worms. Microsoft/Citrix Terminal Services and Microsoft Active Directory are supported.